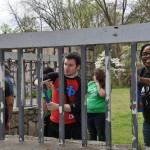 The Brookhaven Park Conservancy, Inc. (“BPC”) is an all volunteer, nonprofit organization incorporated in April 2015 to preserve and improve Brookhaven Park. We are a tax exempt 501(c)(3) nonprofit. Your contributions to us are tax deductible under the IRS code. We look forward to supporting the implementation of a Master Plan for the Park once it is approved by the City Council. 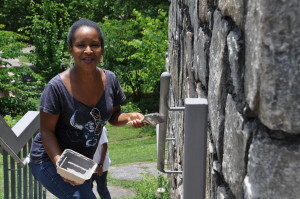 To preserve, enhance and beautify Brookhaven Park as a recreational green space and cultural venue by promoting volunteerism and community investment. ● Promote and support groups using the Park as a cultural venue, using our experience to advocate minimization of the event’s impact on the Park and its surrounding neighborhoods. 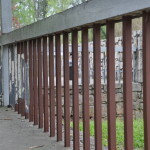 Similar to other parks in north DeKalb County, Brookhaven Park had become overgrown with invasive plants and its amenities had fallen into a state of disrepair. 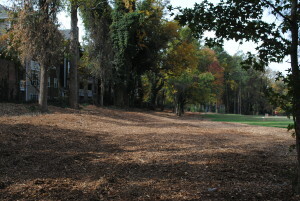 In 2007, a group of concerned citizens, known as the Friends of Brookhaven Park (“Friends”), came together to start restoring the park. 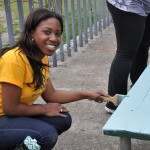 They accomplished this work with the help of neighborhood volunteers and alliances with various civic minded groups. 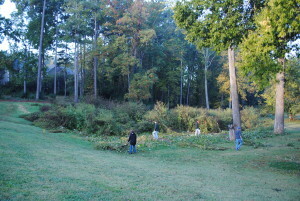 Initially the Friends’ efforts focused on cleaning out invasive plants throughout the park. 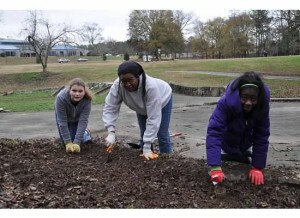 With improvement in the park’s maintenance after its operational transfer to the City of Brookhaven in 2013, the Friends expanded the scope of their activities to beautification and improvement of the park as described further below. 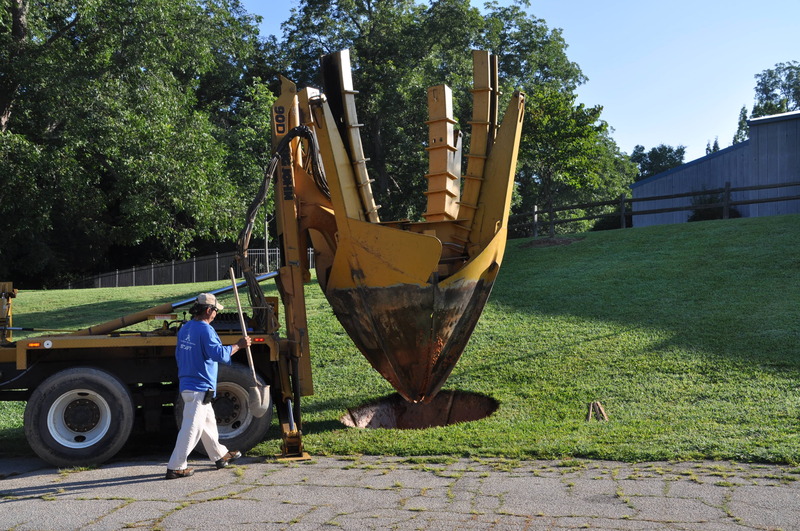 In 2015, with the City’s decision to create a Master Plan for Brookhaven Park, the founders of the Friends decided to form Brookhaven Park Conservancy, Inc., a nonprofit corporation, to support the plan’s implementation. Brookhaven Park Conservancy was incorporated in April 2015 and intends to seek status as a 501 (c)(3) tax exempt organization to position itself to seek grants and tax deductible donations. 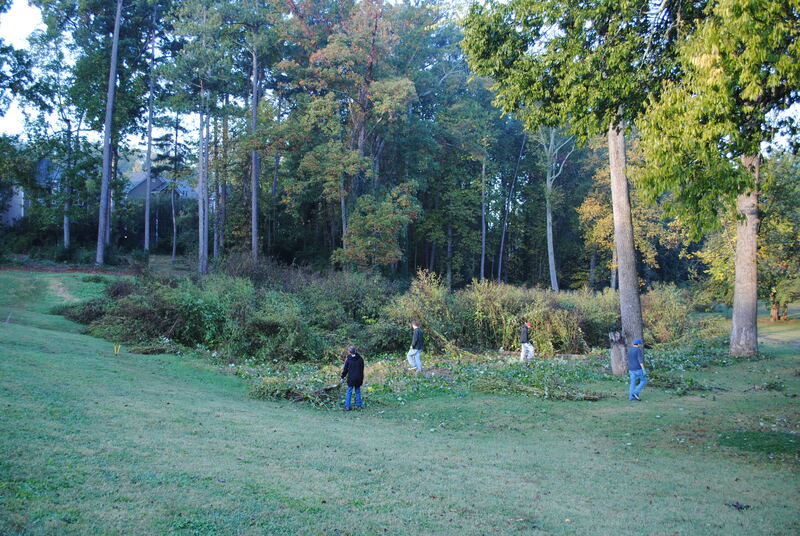 In 2007, restoration focused on clearing areas overgrown with invasive plants. 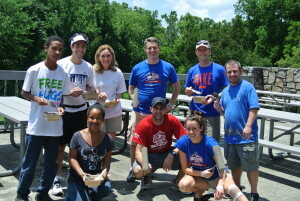 Over the years Oglethorpe University has offered significant support to the Friends by providing volunteers through its Day of Service program, shown above, to supplement the Friends and neighbors efforts with such volunteers. 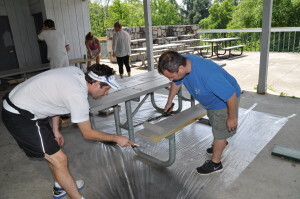 After the City of Brookhaven took over maintenance of the parks in 2013, the Friends expanded their efforts to restoring the larger picnic pavilion and beautifying the Park. 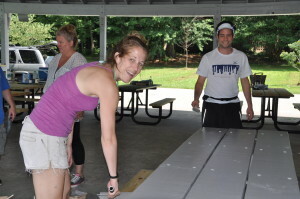 With the help of volunteers from Oglethorpe, Ultimate Frisbee, Soccerfest, and the surrounding neighborhoods, and with support and assistance from the City, the Friends worked over the course of several months in 2014 to remove peeling paint from the pavilion’s guard rails and tables, and to remove and replace broken or warped wood in the pavilion’s rails, picnic tables and benches. It finished the project by painting the interior walls of the pavilion and its amenities. 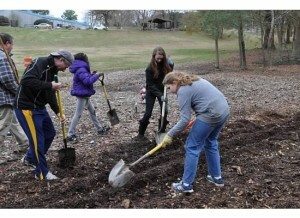 From late 2013 through Spring 2015, the Friends worked with Lovett’s Girl Scout Troup 28300 to design a park improvement project in connection with its desire to achieve a Silver Award. The Girl Scouts raised money and, with assistance from the Friends of Brookhaven Park’s Carole Simpson of Ashe-Simpson Nursery, purchased over 600 daffodils bulbs which the Girl Scouts and Friends planted throughout the park in December 2013. 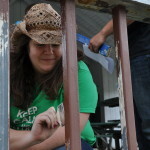 Girl Scout leader Stephanie Hammond directs planting. 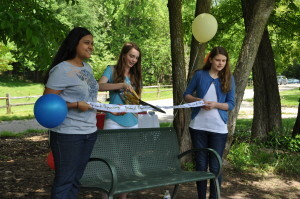 With financial support from Post HOPE Foundation Inc. and the Friends, the Girl Scouts contributed a park bench that was dedicated April 26, 2015. 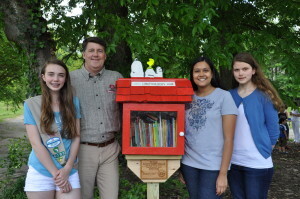 The Girl Scouts also dedicated a Little Free Library, shaped like a dog house with Snoopy on top, that they partnered with Cross Keys Foundation to build and install. Dr. Mark St. Onge, Buckhaven Veterinary Clinic, sponsored the library. Girl Scouts dedicating bench sponsored by Post HOPE Foundation, Inc. and the Friends of Brookhaven Park . Girl Scouts constructed the Little Free Libary sponsored by Cross Keys Foundation and Dr. Mark St. Onge. 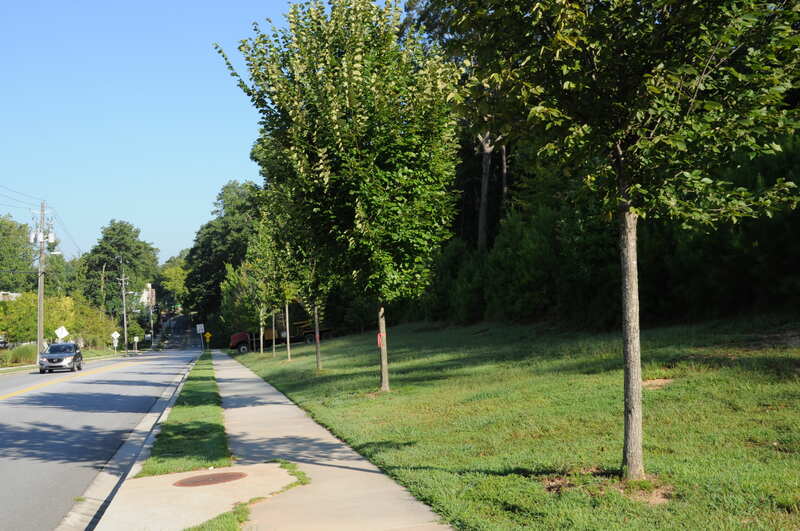 In August 2014, the Friends worked with Gables Residential to conduct a tree save operation of 22 trees over twenty feet in height located in an apartment construction site on Hermance Drive. 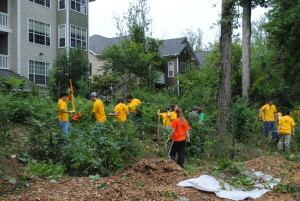 Mike Elliot of the Friends’ worked with Gables Residential, the City, its arborist, the County, and DeKalb Services Center to facilitate the project. 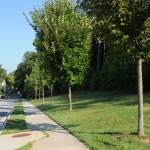 The trees were transplanted into Brookhaven Park creating a tree lined corridor along the pathway between DeKalb Services Center and the park. 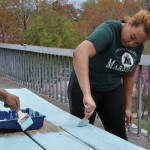 Friends funded the project upfront and the Gables-Oglethrope University joint venture contributed funds to reimburse the spading and aftercare costs. For more information, see coverage on the Brookhaven Post. 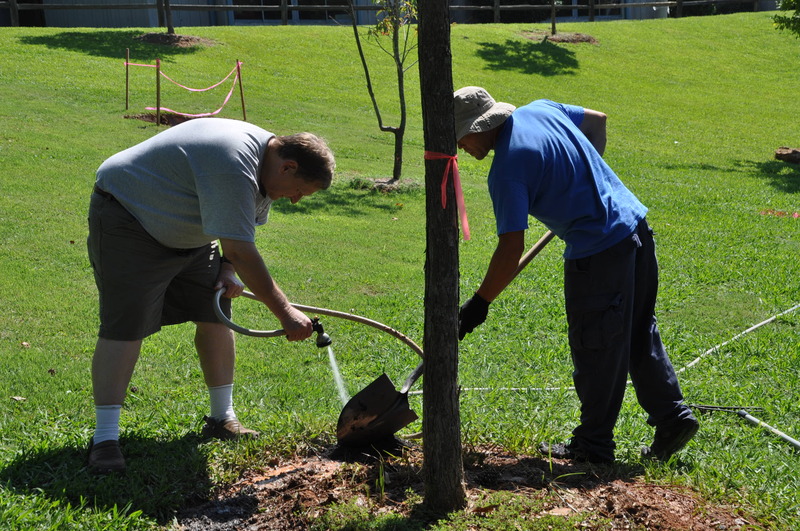 Caring for newly planted trees.